Yesterday afternoon and evening we hosted the annual Christmas gathering of volunteers, partly as a thank you for everyone’s time and hard work over the last 12 months, partly as just an opportunity to get together for a bit of fun without the work and, as I told them last night, partly to keep everyone sweet so they continue to turn out week after week and help us manage and maintain the nature reserve and educational work to the high standard that we strive for. It always sounds cheesy, but it is true that without them the site would not be half the site that it is. 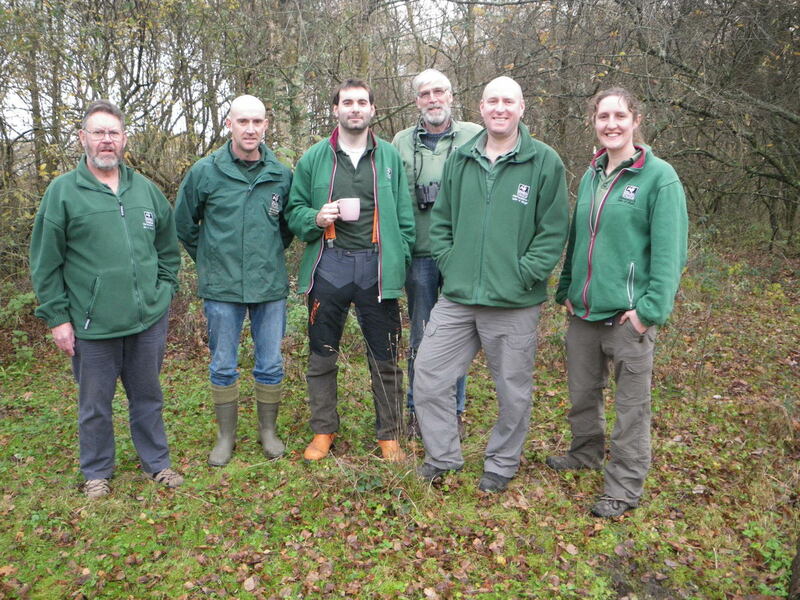 Pictured above (in a slight interruption to the starling roost watching that we had been doing and continued to do after the photo was taken!) 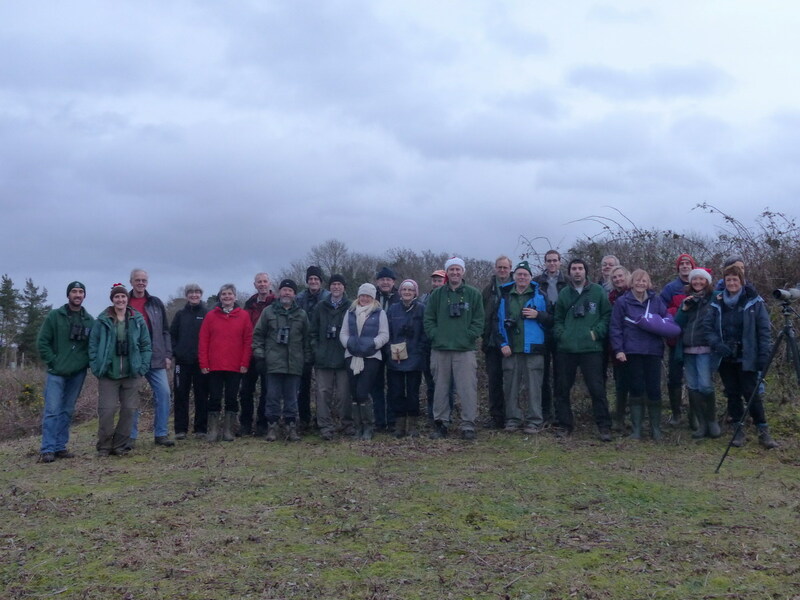 are just some of the volunteers that help us keep up our good work – thanks again everyone : ). And in case anyones wondering, yes the starlings did turn up though possibly not in quite the numbers that there have been and with a somewhat gloomy and overcast sky, nor was it one of the more breathtaking displays, but nice to see none-the-less. True to form the volunteers managed to come to Blashford during the better weather and today it has been pretty miserable! I expected the Dockens Water to be high after last nights rain and I wasn’t disappointed – although it regularly does run a lot deeper/wider (at least a foot deeper than this along this section by the river dipping area), it was higher this morning than I’ve seen for a while – good for sea trout! The Dockens Water this morning – looking out from the information panel opposite the “lower centre car park”. With more rain on the way it seemed prudent to check on the flood prone footpaths on the approach to Lapwing Hide – all still passable in walking boots at the moment if you take care, but I wouldn’t try it in shoes or trainers, so we did put out the temporary signs advising visitors to take the “long way” up to Lapwing Hide around the edge of the reedbed rather than that up through the middle. It was nice to get to a bit of the reserve I don’t get to so much, even in the rain, doubly so as the wildfowl are so much closer to the hides on that side of Ibsley Water than they are at Tern Hide. Lapwing Hide in particular had good numbers of wigeon, gadwall and coot and reports in the record book of black necked grebe on Thursday, while in the more sheltered water at Goosander Hide there were at least 20 goosander, loads of pintail ducks and a red crested pochard. View from Lapwing Hide, with wigeon on the grassy spit. View from Goosander Hide – the goosander were all either on, or just off, the bank of the spit opposite the hide. The great white egret is still on Ivy Lake and with siskin coming down to the feeders more I put up a niger feeder in the centre car park – within 3 minutes 3 siskin had found it and since then most of the feeder ports have had siskin on for most of the day. No redpoll yet though! It didn’t take long for the siskin to find the new feeder! Other than that the only other things of any particular note were treecreeper (a bird that seems to do well at Blashford, or at least is more easily seen here than in other woodlands), of which I saw 3 while opening up (unless of course it was the same bird in different locations). The white of the belly contrasting starkly with the otherwise gloomy and grey background today. I am now looking forward to a few days off with the family over Christmas but someone will be in to open up as normal everyday except Christmas Day over the coming couple of weeks. So on that note it only leaves me to wish you a merry Christmas and a happy new year from all of the staff at Blashford (pictured below for the first time!). Happy Christmas from the team! Steve, Adam, Ed, Bob, Jim and Michelle!